The AV valves are invariably abnormal in patients with atrioventricular septal defects. At one end of the spectrum of atrioventricular septal defects, incomplete atrioventricular septal defects, also termed ostium primum atrial septal defects (ASDs), have only a deficiency in the inferior portion of the atrial septum immediately superior to the AV valves and have 2 valve orifices. The other end of the spectrum encompasses complete atrioventricular septal defects, with both ASDs and ventricular septal defects (VSDs) and a single common AV valve. In addition to the term "atrioventricular septal defects," these congenital abnormalities have been described by several other terms, including AV canal defects, endocardial cushion defects, and AV communis. In 1955, Lillehei and colleagues reported the first successful repair of an atrioventricular (AV) septal defect (AVSD) using the technique of cross circulation. Early mortality rates for the repair of AVSDs were 50%. Complications, including complete heart block and AV valve regurgitation, were also common. In 1958, Lev delineated the bundle of His, which helped decrease the incidence of heart block following surgery. An improved understanding of the structure and function of the common AV valve and a realization of the importance of closing the mitral cleft led to refinements in surgical technique that have decreased the short-term and long-term incidence of AV valve regurgitation. By the 1970s, improvements in surgical techniques and cardiopulmonary bypass resulted in the ability to repair AVSDs with low morbidity and mortality rates in children. Further refinements have allowed successful repair of even complex variations of AVSDs in infancy. Atrioventricular septal defects (AVSDs) represent a spectrum of defects involving varying degrees of deficiency of the atrial and ventricular septae. The common pathophysiology is right-to-left shunting at the atrial level, ventricular level, or both. These septal defects are accompanied by atrioventricular (AV) valve abnormalities, which may lead to regurgitation, further complicating the problem. The goals of surgical treatment are to close the atrial and ventricular defects while preserving or improving AV valve function in both the short term and the long term. The embryologic abnormality in atrioventricular (AV) septal defects (AVSDs) is failure of the proper development of the endocardial cushions, which are responsible for the septation of the atria and ventricles. The exact causal factors are unknown. In the absence of left AV valve regurgitation, the hemodynamic features are the result of left-to-right shunting at the atrial and ventricular levels. In the absence of ventricular level shunting, the hemodynamics resemble those of a typical secundum atrial septal defect (ASD) with right atrial (RA) and right ventricular (RV) volume overload. As with an uncomplicated ASD, the natural history of decades of chronic volume overload results in atrial dilatation and arrhythmias, ventricular dysfunction, and, potentially, pulmonary vascular disease. Moderate or severe left AV valve regurgitation occurs in approximately 10% of patients with an incomplete atrioventricular septal defects. The regurgitant jet is often directed into the RA and is often termed a left ventricle (LV)–to–RA shunt. Although this term is not strictly accurate because the jet actually goes from the LV to the left atrium (LA) to the RA, the result is an increase in the magnitude of the left-to-right shunt. The clinical presentation of a patient with an incomplete atrioventricular (AV) septal defect (AVSD) with isolated atrial level shunting is similar to that observed in a patient with a typical secundum atrial septal defect (ASD). Upon physical examination, an active precordium, a pulmonary outflow murmur, and a fixed widely split second heart sound is present. Clinical presentation is complicated by a moderate or severe left AV valve regurgitation in approximately 10% of patients with an incomplete AVSD. The regurgitant jet is often directed into the right atrium (RA) and is often termed a left ventricular (LV)-to-RA shunt (although, more accurately, it is termed an LV-to-left atrium [LA]-to-RA shunt) and increases the magnitude of the left-to-right shunt. These patients may present early in life with symptoms of congestive heart failure (CHF), including pulmonary congestion and infection, dyspnea, tachycardia, and failure to thrive. Inability to medically control the CHF is an indication for earlier surgical intervention in these patients. However, symptoms in the first year of life may indicate the presence of associated left-sided anomalies, which exacerbate the left-to-right shunt and include LV hypoplasia, LV outflow tract obstruction, and aortic arch obstruction. Patients with a complete AVSD with both atrial and ventricular level shunting usually present early in infancy with signs and symptoms of CHF. Clinical presentation is worsened by moderate or severe left AV valve regurgitation, which occurs in approximately 10% of patients with a complete AVSD. Upon physical examination, the precordium is hyperactive, often with a prominent thrill. Auscultatory findings include a systolic murmur along the left sternal border, a high-pitched murmur at the apex resulting from left AV valve regurgitation, and a mid-diastolic flow murmur across the common AV valve. In the presence of elevated pulmonary vascular resistance, a split first heart sound may be present. For a partial AVSD, also termed a primum atrial septal defect (ASD), the hemodynamics resemble that of a typical secundum ASD with right atrial (RA) and right ventricular (RV) volume overload. As with an uncomplicated ASD, the natural history of decades of chronic volume overload results in atrial dilatation and arrhythmias, ventricular dysfunction, and, potentially, pulmonary vascular disease. Therefore, repair is indicated and is usually performed by age 2-4 years in a patient with partial AVSD. Moderate or severe left AV valve regurgitation occurs in approximately 10% of patients with an incomplete AVSD. The regurgitant jet is often directed into the RA, resulting in an increase in the magnitude of the left-to-right shunt. These patients may present early in life with symptoms of congestive heart failure (CHF), including pulmonary congestion and infection, dyspnea, tachycardia, and failure to thrive. Inability to medically control CHF is an indication for earlier surgical intervention in these patients. According to Newfeld et al, as many as 90% of untreated individuals with a complete AVSD develop pulmonary vascular disease by age 1 year as a result of the large left-to-right shunt, potentially exacerbated by the associated AV valve regurgitation. Patients with trisomy 21 tend to develop pulmonary vascular obstructive disease earlier than infants with normal karyotypes because of small airway disease, chronic hypoventilation, and elevated partial pressure of carbon dioxide (PCO2). Undertake initial aggressive medical management to relieve symptoms of CHF. Perform elective surgical correction by age 3-6 months in infants with AVSD. Earlier intervention is indicated for failure of medical management. From a surgical standpoint, the most useful classification subdivides atrioventricular (AV) septal defects (AVSDs) into incomplete and complete, based on AV valve morphology. Incomplete or partial defects have 2 AV valve orifices as a result of the continuity between the left superior leaflet (LSL) and the left inferior leaflet (LIL). Although the development of the commissures varies, 6 leaflets are usually present (see the image below). (a) An incomplete atrioventricular septal defect (AVSD) with right superior leaflet (RSL), right lateral leaflet (RLL), right inferior leaflet (RIL), left superior leaflet (LSL), left lateral leaflet (LLL), and left inferior leaflet (LIL). (b) A complete ASD with superior bridging leaflet (SBL), inferior bridging leaflet (IBL), LLL, RSL, and RIL. The locations of the atrioventricular (AV) node and bundle of His are indicated. All images are surgeon's-eye views with cranial leftward, caudad rightward, superior upward, and posterior downward. The right-sided AV valve consists of the right superior leaflet (RSL), right lateral leaflet (RLL), and right inferior leaflet (RIL). The LSL, left lateral leaflet (LLL), and LIL form the left-sided AV valve. 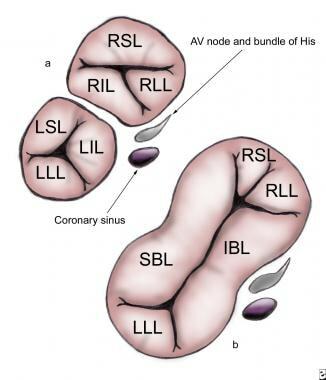 The commissure between the LSL and LIL represents the cleft of the left AV valve. Although most incomplete AVSDs have no ventricular level shunting, classification of an AVSD as complete or incomplete depends only on the valve anatomy and not on the presence or absence of a ventricular septal defect (VSD). As in all AVSDs, the inlet septum in incomplete AVSDs is deficient. The continuity of the LSL and LIL forms a bridge of tissue, which obliterates the potential for shunting below the leaflets. Incomplete defects without associated ventricular level shunting have also been termed ostium primum atrial septal defects (ASDs), whereas those with a VSD have been described as intermediate or transitional AVSDs. Complete AVSDs have a single common AV valve orifice resulting in a 5-leaflet valve (see the image below). These leaflets are termed the left superior or superior bridging leaflet (SBL), left inferior or inferior bridging leaflet (IBL), LLL, RSL, and RIL. Alternatively, the superior and inferior leaflets also may be termed anterior and posterior, respectively. Rastelli classification. (a) Rastelli type A. (b) Rastelli type B. (c) Rastelli type C.
In a Rastelli type A defect, the SBL is divided at the plane of the interventricular septum and attached to the crest of the VSD by numerous cordae. Type B complete AVSDs, which are rare, are characterized by cordal attachments from the left AV valve to papillary muscles in the right ventricle (RV). In a Rastelli type C defect, the SBL is said to be "free floating" because it is undivided and unattached to the crest of the VSD. Both left and right AV valves may equally share the common AV valve orifice. This arrangement is termed a balanced defect. Occasionally, the orifice may favor the right AV valve (right dominance) or the left AV valve (left dominance). In marked right dominance, the left AV valve and LV are hypoplastic; frequently, they coexist with other left-sided abnormalities including aortic stenosis, hypoplasia of the aorta, and coarctation. Conversely, marked left dominance results in a deficient right AV valve with associated hypoplasia of the RV, pulmonary stenosis or atresia, and tetralogy of Fallot (TOF). Ventricular balance is based on the size of the ventricular inlet, not on the size of the ventricular chamber, and is assessed best on the 4-chamber view on echocardiography. Because the conduction tissue is at risk during repair, its location is of importance in the surgical treatment of AVSDs. 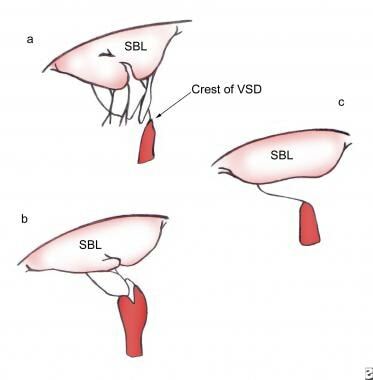 The AV node is displaced posteriorly and inferiorly toward the coronary sinus in what has been termed the nodal triangle, which is bounded by the coronary sinus, the posterior attachment of the IBL, and the rim of the ASD (see the image below). The bundle of His courses anteriorly and superiorly to run along the leftward aspect of the crest of the VSD, giving off the left bundle branch and continuing as the right bundle branch. According to Bharati et al, numerous other cardiac anomalies are associated with AVSDs including patent ductus arteriosus (found in 10% of individuals with AVSD) and TOF (found in 10% of individuals with AVSD). Of the important abnormalities of the left AV valve, according to Draulans-Noe et al, 2-6% of patients with AVSD have a single papillary muscle (parachute mitral valve) and 8-14% of persons with AVSD have a double-orifice mitral valve. Bharati et al state that a persistent left superior vena cava, with or without an unroofed coronary sinus, is encountered in 3% of patients with an AVSD. Double-outlet RV, which is found in 2% of individuals with AVSD, significantly complicates or may even preclude complete surgical correction. As mentioned previously, LV outflow tract obstruction from subaortic stenosis or redundant AV valve tissue occurs in 4-7% of individuals with AVSD, according to Studer et al and Piccoli et al. [8, 9] Associated transposition of the great arteries and LV inflow obstruction have rarely been reported. The treatment of choice for an incomplete or complete atrioventricular (AV) septal defect (AVSD) is complete surgical repair. Pulmonary artery banding for palliation of symptoms of congestive heart failure (CHF) has a limited role in the management of these lesions. Indications for pulmonary artery banding may include patients with associated complex cardiac anomalies, severely unbalanced defects, or other functional single ventricle anatomy necessitating an ultimate Fontan procedure and a poor clinical condition precluding major cardiac surgery. According to Newfeld et al, as many as 90% of untreated patients with a complete AVSD develop pulmonary vascular obstructive disease. As with a secundum atrial septal defect (ASD), patients with a partial AVSD are at risk for developing pulmonary vascular obstructive disease in the third, fourth, and fifth decades of life. Cardiac catheterization is recommended for patients presenting later in life for repair. A pulmonary vascular resistance of greater than 10 Wood units is a contraindication to surgical repair. Christensen N, Andersen H, Garne E, et al. Atrioventricular septal defects among infants in Europe: a population-based study of prevalence, associated anomalies, and survival. Cardiol Young. 2013 Aug. 23 (4):560-7. [Medline]. Muresan D, Marginean C, Zaharie G, Stamatian F, Rotar IC. Complete atrioventricular septal defect in the era of prenatal diagnosis. Med Ultrason. 2016 Dec 5. 18 (4):500-7. [Medline]. Spicer RL. Cardiovascular disease in Down syndrome. Pediatr Clin North Am. 1984 Dec. 31(6):1331-43. [Medline]. Lillehei CW, Cohen M, Warden HE. The direct-vision intracardiac correction of congenital anomalies by controlled cross-circulation: results in thirty-two patients with ventricular septal defects, tetralogy of Fallot, and atrioventicularis communis defects. Surgery. 1955. 38:11. Lev M. The architecture of the conduction system in congenital heart disease: I. Common atrioventricular orifice. Arch Pathol. 1958. 65:174. Newfeld EA, Sher M, Paul MH, Nikaidoh H. Pulmonary vascular disease in complete atrioventricular canal defect. Am J Cardiol. 1977 May 4. 39(5):721-6. [Medline]. Rastelli G, Kirklin JW, Titus JL. Anatomic observations on complete form of persistent common atrioventricular canal with special reference to atrioventricular valves. Mayo Clin Proc. 1966 May. 41(5):296-308. [Medline]. Studer M, Blackstone EH, Kirklin JW, et al. Determinants of early and late results of repair of atrioventricular septal (canal) defects. J Thorac Cardiovasc Surg. 1982 Oct. 84(4):523-42. [Medline]. Piccoli GP, Wilkinson JL, Macartney FJ, et al. Morphology and classification of complete atrioventricular defects. Br Heart J. 1979 Dec. 42(6):633-9. [Medline]. Bharati S, Kirklin JW, McAllister HA Jr, Lev M. The surgical anatomy of common atrioventricular orifice associated with tetralogy of Fallot, double outlet right ventricle and complete regular transposition. Circulation. 1980 Jun. 61(6):1142-9. [Medline]. Draulans-Noe HA, Wenink AC, Quaegebeur J. Single papillary muscle ("parachute valve") and double-orifice left ventricle in atrioventricular septal defect convergence of chordal attachment: surgical anatomy and results of surgery. Pediatr Cardiol. 1990 Jan. 11(1):29-35. [Medline]. Harmandar B, Aydemir NA, Karaci AR, et al. Results for surgical correction of complete atrioventricular septal defect: associations with age, surgical era, and technique. J Card Surg. 2012 Nov. 27 (6):745-53. [Medline]. Puga FJ. Reoperation after repair of atrioventricular canal defects. Semin Thorac Cardiovasc Surg Pediatr Card Surg Annu. 1998. 1:123-8. [Medline]. Stewart S, Alexson C, Manning J. Partial atrioventricular canal defect: the early and late results of operation. Ann Thorac Surg. 1987 May. 43(5):527-9. [Medline]. Nunn GR. Atrioventricular canal: modified single patch technique. Semin Thorac Cardiovasc Surg Pediatr Card Surg Annu. 2007. 28-31. [Medline]. McElhinney DB, Reddy VM, Silverman NH, et al. Atrioventricular septal defect with common valvar orifice and tetralogy of Fallot revisited: making a case for primary repair in infancy. Cardiol Young. 1998 Oct. 8(4):455-61. [Medline]. Najm HK, Van Arsdell GS, Watzka S, et al. Primary repair is superior to initial palliation in children with atrioventricular septal defect and tetralogy of Fallot. J Thorac Cardiovasc Surg. 1998 Dec. 116(6):905-13. [Medline]. Ong J, Brizard CP, d'Udekem Y, et al. Repair of atrioventricular septal defect associated with tetralogy of Fallot or double-outlet right ventricle: 30 years of experience. Ann Thorac Surg. 2012 Jul. 94 (1):172-8. [Medline]. Vitanova K, Cleuziou J, Schreiber C, et al. Long-term outcome of patients with complete atrioventricular septal defect combined with the tetralogy of Fallot: staged repair is not inferior to primary repair. Ann Thorac Surg. 2017 Mar. 103 (3):876-80. [Medline]. Buratto E, Ye XT, King G, et al. Long-term outcomes of single-ventricle palliation for unbalanced atrioventricular septal defects: Fontan survivors do better than previously thought. J Thorac Cardiovasc Surg. 2017 Feb. 153 (2):430-8. [Medline]. Arunamata A, Balasubramanian S, Mainwaring R, Maeda K, Selamet Tierney ES. Right-dominant unbalanced atrioventricular septal defect: echocardiography in surgical decision making. J Am Soc Echocardiogr. 2017 Mar. 30 (3):216-26. [Medline]. Minich LL, Tani LY, Pagotto LT, et al. Size of ventricular structures influences surgical outcome in Down syndrome infants with atrioventricular septal defect. Am J Cardiol. 1998 Apr 15. 81(8):1062-5. [Medline]. Hanley FL, Fenton KN, Jonas RA, et al. Surgical repair of complete atrioventricular canal defects in infancy. Twenty-year trends. J Thorac Cardiovasc Surg. 1993 Sep. 106(3):387-94; discussion 394-7. [Medline]. Prifti E, Bonacchi M, Baboci A, Giunti G, Krakulli K, Vanini V. Surgical outcome of reoperation due to left atrioventricular valve regurgitation after previous correction of complete atrioventricular septal defect. J Card Surg. 2013 Nov. 28 (6):756-63. [Medline]. Vida VL, Tessari C, Castaldi B, et al. Early correction of common atrioventricular septal defects: a single-center 20-year experience. Ann Thorac Surg. 2016 Dec. 102 (6):2044-51. [Medline]. Buratto E, Ye XT, Bullock A, et al. Long-term outcomes of reoperations following repair of partial atrioventricular septal defect. Eur J Cardiothorac Surg. 2016 Aug. 50 (2):293-7. [Medline]. Kadoba K, Jonas RA, Mayer JE, Castaneda AR. Mitral valve replacement in the first year of life. J Thorac Cardiovasc Surg. 1990 Nov. 100(5):762-8. [Medline]. Miller A, Siffel C, Lu C, Riehle-Colarusso T, Frias JL, Correa A. Long-term survival of infants with atrioventricular septal defects. J Pediatr. 2010 Jun. 156(6):994-1000. [Medline]. Berger TJ, Kirklin JW, Blackstone EH, et al. Primary repair of complete atrioventricular canal in patients less than 2 years old. Am J Cardiol. 1978 May 1. 41(5):906-13. [Medline]. Reddy VM, McElhinney DB, Brook MM, et al. Atrioventricular valve function after single patch repair of complete atrioventricular septal defect in infancy: how early should repair be attempted?. J Thorac Cardiovasc Surg. 1998 May. 115(5):1032-40. [Medline]. Michielon G, Stellin G, Rizzoli G, Casarotto DC. Repair of complete common atrioventricular canal defects in patients younger than four months of age. Circulation. 1997 Nov 4. 96(9 Suppl):II-316-22. [Medline]. Vet TW, Ottenkamp J. Correction of atrioventricular septal defect. Results influenced by Down syndrome?. Am J Dis Child. 1989 Nov. 143(11):1361-5. [Medline]. Suzuki T, Bove EL, Devaney EJ, et al. Results of definitive repair of complete atrioventricular septal defect in neonates and infants. Ann Thorac Surg. 2008 Aug. 86(2):596-602. [Medline]. Atz AM, Hawkins JA, Lu M, et al. Surgical management of complete atrioventricular septal defect: Associations with surgical technique, age, and trisomy 21. J Thorac Cardiovasc Surg. 2011 Jun. 141(6):1371-9. [Medline]. [Full Text]. Kaza AK, Colan SD, Jaggers J, et al. Surgical interventions for atrioventricular septal defect subtypes: the pediatric heart network experience. Ann Thorac Surg. 2011 Oct. 92(4):1468-75. [Medline]. St Louis JD, Jodhka U, Jacobs JP, et al. Contemporary outcomes of complete atrioventricular septal defect repair: analysis of the Society of Thoracic Surgeons Congenital Heart Surgery Database. J Thorac Cardiovasc Surg. 2014 Dec. 148 (6):2526-31. [Medline]. Karatza AA, Bush A, Magee AG. Safety and efficacy of Sildenafil therapy in children with pulmonary hypertension. International Journal of Cardiology. 2005. 100:267-273. [Medline]. Nicholson IA, Nunn GR, Sholler GF, et al. Simplified single patch technique for the repair of atrioventricular septal defect. J Thorac Cardiovasc Surg. 1999 Oct. 118(4):642-6. [Medline]. Thies WR, Breymann T, Matthies W, et al. Primary repair of complete atrioventricular septal defect in infancy. Eur J Cardiothorac Surg. 1991. 5(11):571-4. [Medline]. El-Rassi I, Charafedine F, Majdalani M, Arabi M, Khater D, Bitar F. Surgical repair of partial atrioventricular defect. Multimed Man Cardiothorac Surg. 2015. 2015:[Medline]. Gao C, Yang M, Xiao C, Zhang H. Totally robotic repair of atrioventricular septal defect in the adult. J Cardiothorac Surg. 2015 Nov 6. 10:156. [Medline]. Ghosh P, Bhaumik P, Ghosh S, Ozbek U, Feingold E, Maslen C, et al. Polymorphic haplotypes of CRELD1 differentially predispose Down syndrome and euploids individuals to atrioventricular septal defect. Am J Med Genet A. 2012 Nov. 158A (11):2843-8. [Medline]. Cohen MS, Jegatheeswaran A, Baffa JM, et al. Echocardiographic features defining right dominant unbalanced atrioventricular septal defect: a multi-institutional Congenital Heart Surgeons' Society study. Circ Cardiovasc Imaging. 2013 Jul. 6 (4):508-13. [Medline]. Backer CL, Eltayeb O, Monge MC, Mazwi ML, Costello JM. Shunt lesions part I: patent ductus arteriosus, atrial septal defect, ventricular septal defect, and atrioventricular septal defect. Pediatr Crit Care Med. 2016 Aug. 17 (8 suppl 1):S302-9. [Medline]. Devlin PJ, Backer CL, Eltayeb O, Monge MC, Hauck AL, Costello JM. Repair of partial atrioventricular septal defect: age and outcomes. Ann Thorac Surg. 2016 Jul. 102 (1):170-7. [Medline]. The common atrioventricular (AV) valve is floated to a closed position using isotonic sodium chloride solution. The central apposition points of the superior and inferior bridging leaflets are identified and marked with fine polypropylene sutures. Two-patch technique. A patch of polytetrafluoroethylene (Gore-Tex) is fashioned and secured along the crest of the ventricular septal defect. Two-patch technique. Interrupted horizontal mattress sutures are placed through the crest of the ventricular septal defect (VSD) patch and the inferior and superior bridging leaflets, dividing the common atrioventricular (AV) valve into right and left components. Two-patch technique. The pericardial patch is secured to the crest of the prosthetic ventricular septum with the superior and inferior bridging leaflet sandwiched between the 2 patches. One-patch technique. The superior and inferior bridging leaflets are divided into right and left components. One-patch technique. The leaflets are resuspended to the patch by passing sutures through the cut edge of the left atrioventricular (AV) valve leaflet, the patch, and the cut edge of the right AV valve and tying the sutures. The cleft of the mitral valve between the superior and inferior bridging leaflets is closed. The atrial septal defect (ASD) is closed with an autologous pericardial patch. The coronary sinus is placed in the left atrium to avoid injury to the conduction system. The rim of the ASD, the atrioventricular (AV) node, and the bundle of His are indicated. The dashes represent the proposed suture line.